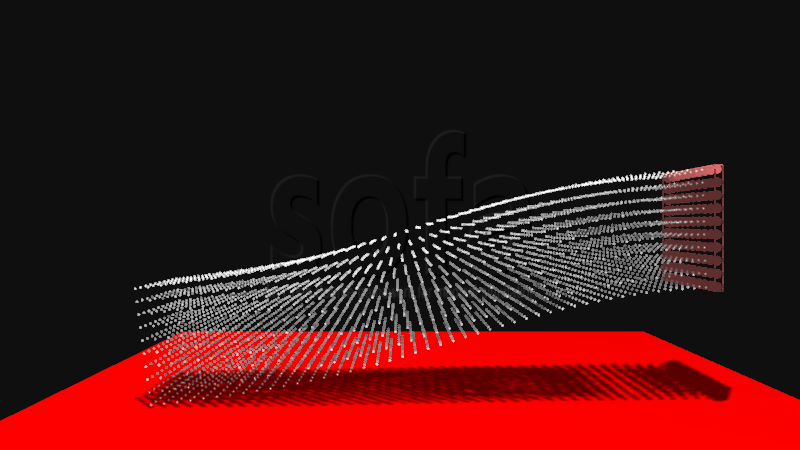 By targeting complex interactive simulations, SOFA needs to achieve high computational performances. The SofaCUDA plugin extends the SOFA architecture and functionalities to handle GPU-based computations, using the CUDA NVidia toolkit. Most of the components (C++ classes) used in SOFA simulation are templated by the type of degrees of freedom. By using a “Cuda” template, new methods and functionnalities will transparently be used in order to provide an efficient yet generic GPU support. These templates will also rely on hybrid CPU/GPU vector containers allowing to access the data either on the CPU or GPU, for read or write operations. Flags are used internally to execute allocation and transfer operations when necessary. With this approach, only the few computationally intensive methods that are used during the simulation loop will need to be specialized and rewritten to be executed on GPU. This plugin has a LGPL open-source license.